When it’s snowy-cold outside and you need a comforting meal, Sausage and Red Pepper Pasta hits the spot. This is an easy, brilliant red and richly flavored pasta sauce that is made from ingredients straight out of the pantry/freezer. The zip of red pepper flakes adds warmth to the savory flavor of pork sausage and roasted red peppers. 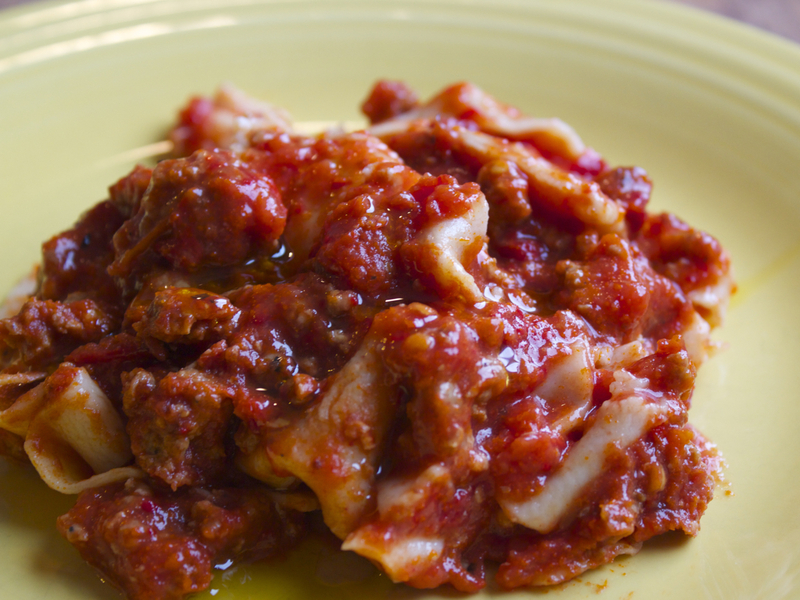 I love to pair this hearty sauce with homemade pappardelle — but any large scale pasta such as rigatoni will do nicely. 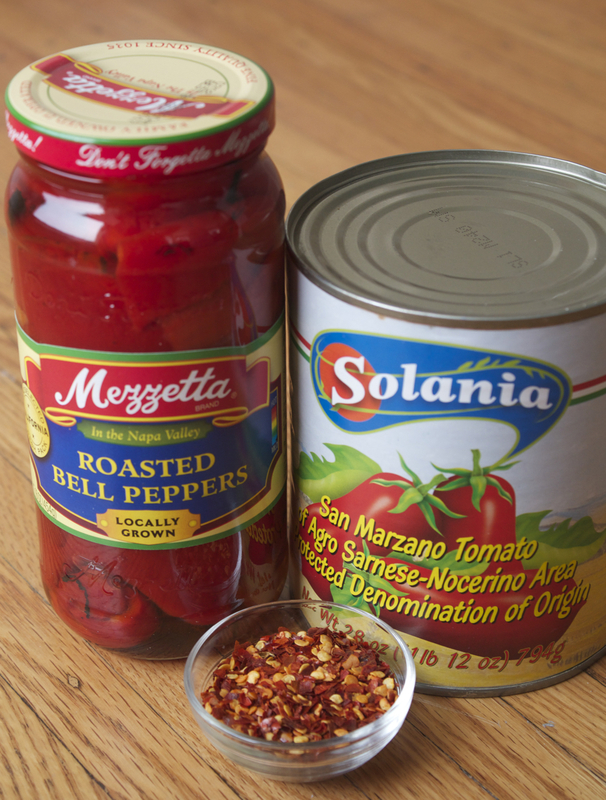 This perfectly red sauce is a great choice for a cozy meal on Valentine’s Day. Enjoy! Heat a medium covered sauce pan over high, then add the sausage. Saute sausage for about 8 minutes, breaking up sausage as you stir. Add the tomatoes, roasted bell peppers, tomato paste, garlic, and wine. Stir to incorporate all ingredients. Add a bit of water if the sauce seems too thick. Bring to a boil, then cover and simmer on low for about an hour. Stir and check for moisture occasionally during the simmering time. Prepare the pasta. When the pasta is al dente, reserve a cup of the pasta water before draining. Drain pasta, then return it to the hot empty pot used to cook pasta. Add the sauce and stir to blend with the cooked pasta. Allow the pasta and sauce to marry for 5 minutes or so. (It’s good to let the happy couple have a little honeymoon in the pot before you dig in – the dish becomes one beautiful whole). Serve with a drizzle of your best olive oil and perhaps some grated Parmigiano-Reggiano. Yum! I am making this today! Yeah! I hope you like it.